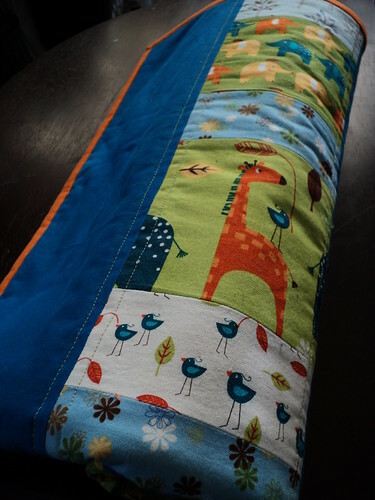 Craft Talk | Sew what? I started my new job so I have been working the last month. My spare time has disappeared and been replaced with a pay cheque. I did manage to finish off a baby quilt for my cousin who is having twins! They are supposed to be two girls. And yes, I knew they were girls when I picked out the fabrics. Why does everything for girls have to be pink? I don’t understand how blues and greens are for boys, they are the colours of nature. I had it rolled/folded up so it is wrinkly in the pictures. I haven’t washed it yet but it will most likely get pretty crinkly when I do. It is a very simple pattern. The prints are Playday in Spring by SEI. Sashing is Kona Pacific. Binding is Kona Orange. 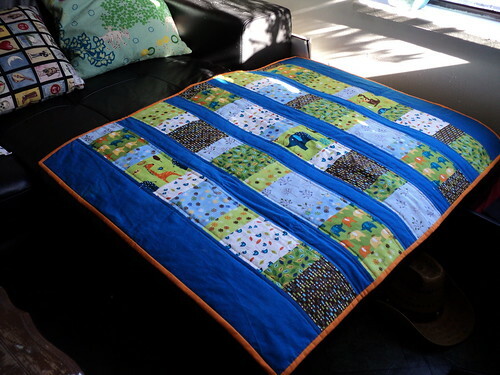 I love looking at the quilts with neutral sashing and classy binding, but I always end up far away from neutral! 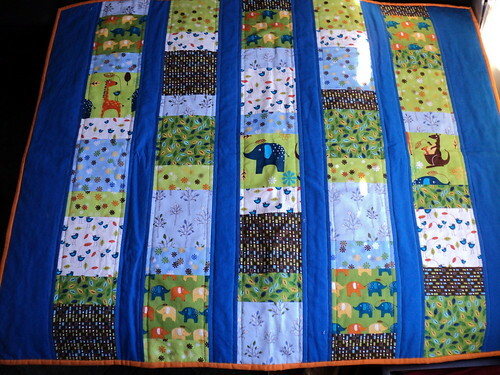 The backing is the elephants in rows on green used in the top quilt. The orientation for the quilt is reversed on the back. The quilting is just shadowed on either side of the seams down the columns. I didn’t have much time so it was a quick way to make it happen. 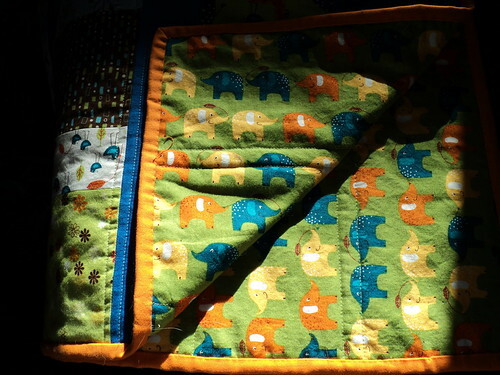 The last quilt I did had denser straight line quilting. I liked it but I found the drape strange. I also suspected less dense quilting is warmer. So now I have to make another. Oi. I have the prints cut out and that is it. I bought some extra white with the blue birds to use for sashing. I’m not sure how I can finish it in time because she is due in August. 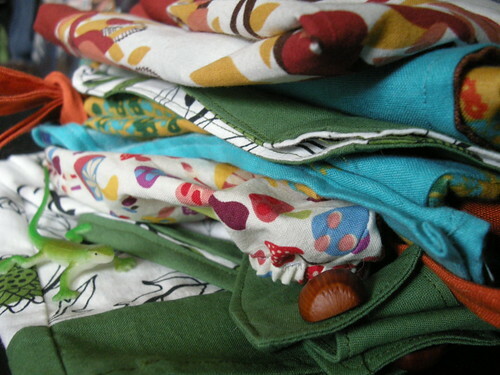 I am tempted to just make a couple of dresses, kimonos, softies or something small to go with the quilt. 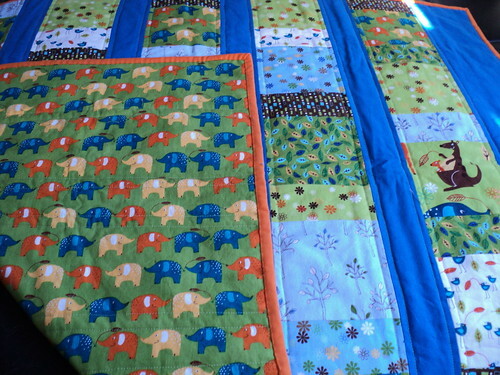 However, everyone says two quilts for twins. Today is my last day of vacation before starting my new job. I thought I would take virtual stock of what I managed to sew during my vacation. 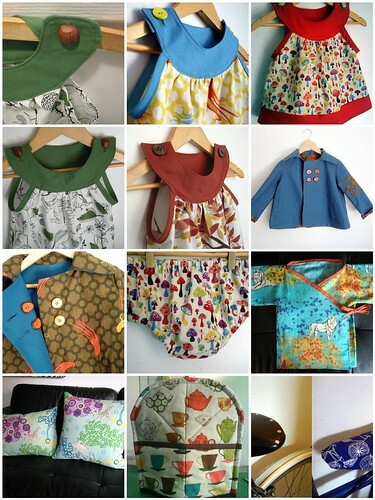 Most of these items are long gone from my home because I like to make tiny clothes and I don’t have kids! I really liked the circle dress/top pattern by that*darn*kat. Or maybe I just wanted to sew it without making any errors! Either way, I made five: two size 3 dresses, one size 2 top and two size 2 dresses. 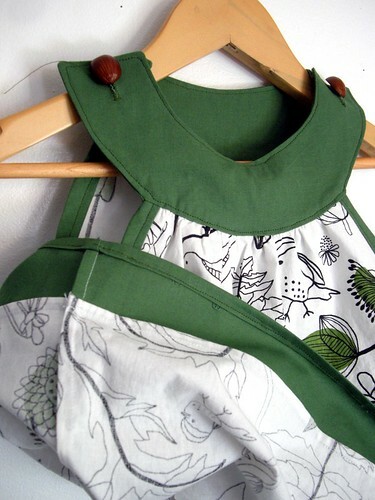 I opted to use prints for the body and solids for the neck and hem. I also prefered the look of a single button on each shoulder instead of two. I think it is easier to get done up and you don’t have to worry about getting the wrong button hole! I like all the prints for these dresses, but my favorite is the Giant Octopus in Natural. In fact, I love it so much I bought some more for my stash! 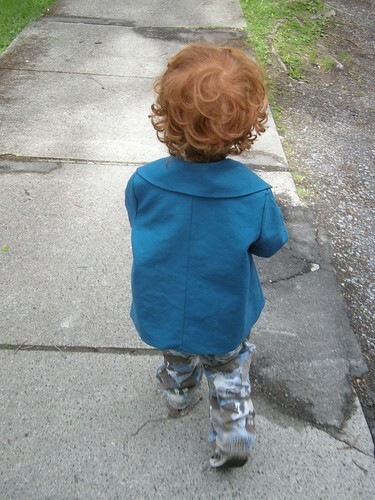 The most involved project was definitely the Octo Reversible Jacket for my nephew. The lining and arm also featured octopi. 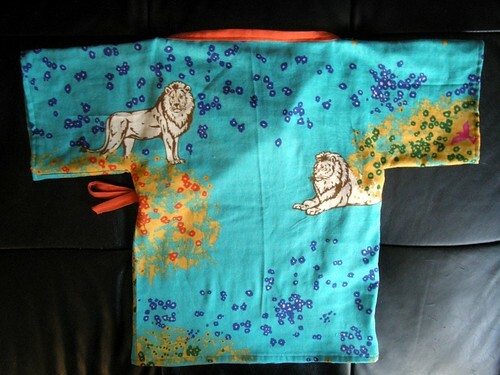 Another ‘boy’ project was the Lion Kimono. I don’t understand the issue with dressing little girls in blues, greens and other ‘boy’ colours. I am sure my niece will rock this kimono if it survives her brother. My vacation is coming to an end! I start work Monday. Today I sent off a package of mostly little clothing to my sizzler for my niece and nephew. I hope they all like it! Today I gifted my first quilt to my friend. He is having his first baby in October and today was his wedding. 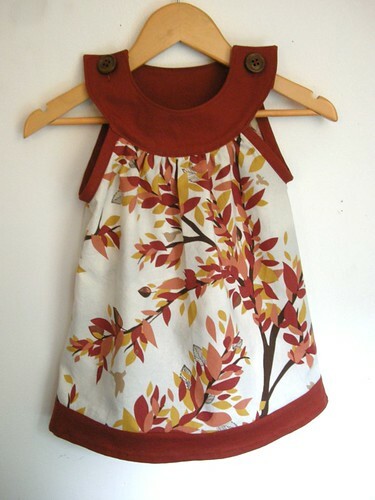 Another little dress for baby F! 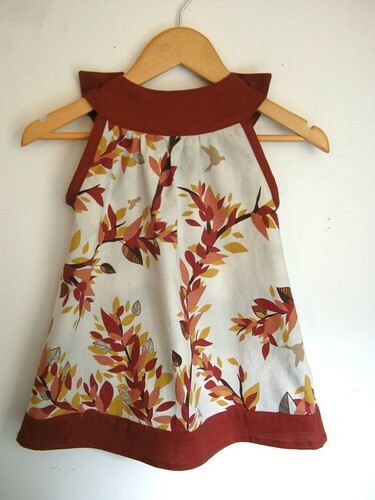 It is a size 2 dress, but I bet she can wear it this summer while still a baby. The size 2 shirt was a bit short for the dress so hopefully this dress will (sort of) fit for the summer. I really like the fabric, Through the Forest in Grey by Studio E House Designer. 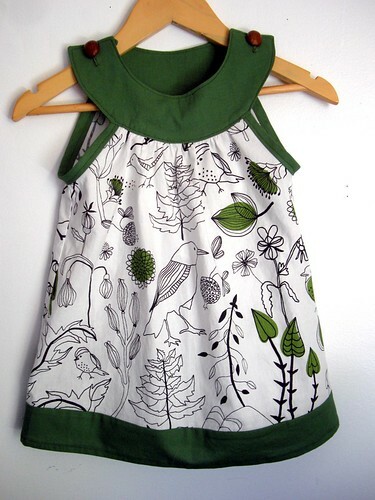 It is a bit classier than my usual choice for little clothes; I could easily see this print on an adult. The solid is Kona Cotton in Paprika I believe. There are a few birds hidden in the branches. The buttons are a simple dark wood. The gathers on the back are slightly concentrated to the left. Oops! I’m not sure if other people would notice. 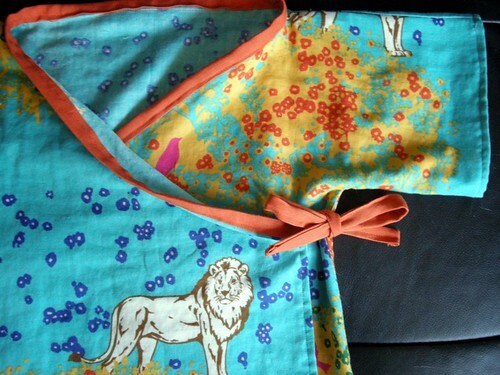 Hello Lion Kimono! You are AWESOME! I would like to take full credit for the level of awesome achieved by this kimono, but 90% of it comes from the fabric. The fabric is a double gauze Japanese import from Echino. Bright turquoise, yellow clouds, hidden birds and, of course, lions! I have made this pattern before from Habitual. In fact, it was my first time on a sewing machine. 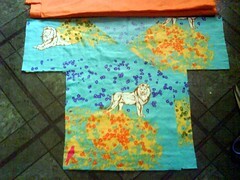 I made it size 4T to leave some growing room for my little lion aka 2.5 year old nephew. Recently he climbed a rock hill and roared, scaring the nearby drinking teenagers. I hope he likes it! I think the lion placement works well. Using such a large scale print would be difficult for a baby sized kimono. And two lions on the back as well. Now that I know how to properly sew on binding, it was much easier to sew the binding around the shoulders compared to my last try. I used linen for the ties. It was my first time using linen and I didn’t really know what I was getting myself into. It was also my first time using double gauze. All my troubles sewing this kimono resulted from my lack of experience with the materials. 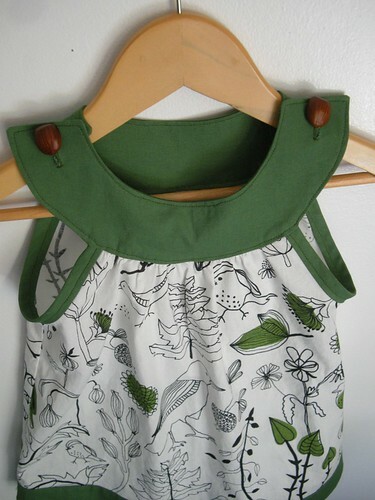 I got my first sewing commission to make a size 2 bird dress. 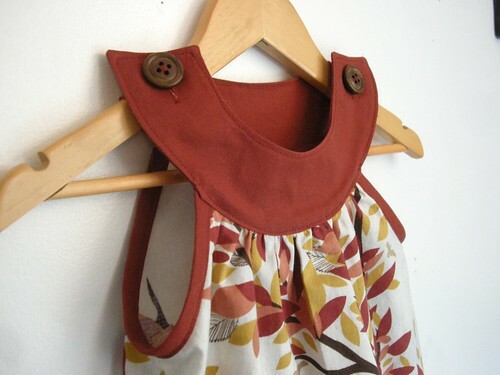 The first bird dress was my first dress. I can definitely see the improvement in my sewing skills! This time I put green binding tape around the arm holes instead of a tiny rolled hem. I still really like the acorn buttons. I think I might have to buy more just in case I need to make another bird dress. I still love love love french seams! I used them for all the dresses I have made and I don’t plan to stop! I don’t have a serger so the quick alternative is a zig-zag stitch. I did use that for the seams in the diaper cover because they only touch the diaper, not any skin. The only downside (besides taking extra time) I have found for french seams is the extra bulk created when hemming. A better sewing machine wouldn’t notice the extra thickness, but mine is very basic. 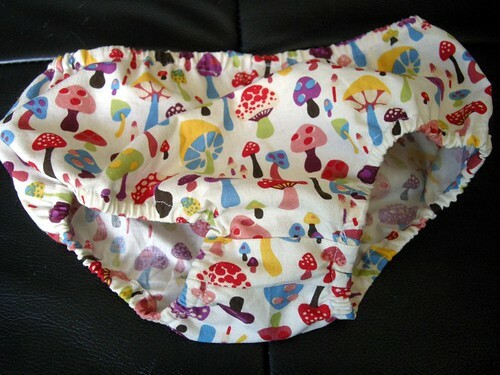 Since the mushroom top (size 2) worked as a short baby dress, I decided a diaper cover was in order. I used the free pattern from Prudent Baby. I’m not sure if you can tell from the picture, but these baby thighs are huuuuuge! To accommodate her thighs, this 7 month old baby wears 24 month capris for jeans. They will slim out when she start running around, but I increased the elastic length for the leg holes so they won’t pinch this summer. I did have to make one modification to the pattern. My left over fabric wasn’t big enough for the full back piece (it is bigger than the front to allow for diaper bum). I added a small crotch piece, shown in the picture below. My only trouble making this cover happened when trying to feed the elastic in casing around the first leg hole. I could only get the safety pin over the seams in the direction they were pressed! Otherwise the seam would get bunched and I hit a dead end. This issue wouldn’t have been a big problem if I just had the two seams, but the extra seam due to the extra crotch piece was in the wrong direction. I had to sew the casing again, leaving the hole to feed the elastic at the extra crotch piece. It worked! In other news, I hate when I have to “fold over 1/*”, press, fold over another 1/*” and press again.” It is especially annoying on small curved parts. In better news, I have noticed my sewing machine skills have improved drastically over this past month! I cut my new Echino fabric! 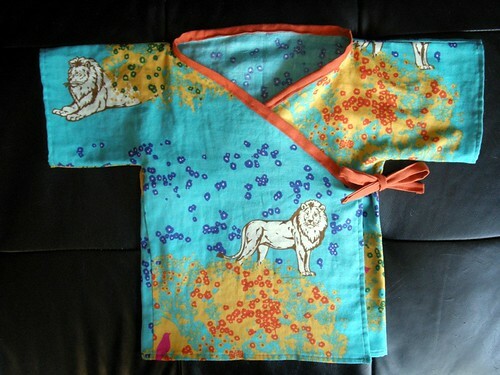 Pictured is a future size 4T kimono. The tangerine linen is for the ties. I am also making a size 4/5 dress and a scarf. I bought some copper (lightish brown) linen for the back of the scarf. I am not sure which colour to use for the dress neck and hem. The babies came to visit! I turned over my stash of handmade clothes. 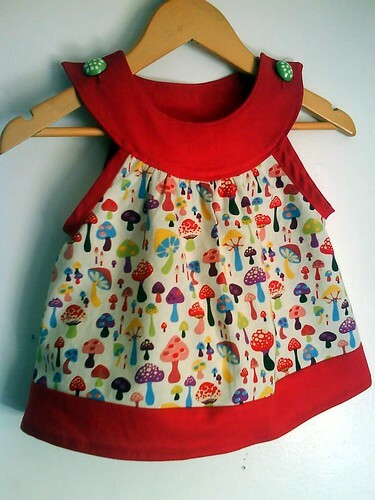 The dresses are too big for baby, but the mushroom top and octo jacket were put to use. 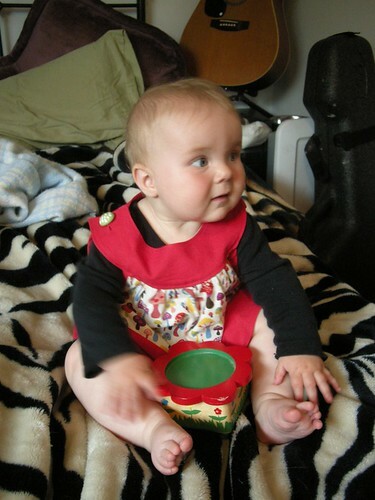 Here is 7 month old baby F rocking the size 2 mushroom top over a black onesie. Plenty of room to grow. Chilling on the traffic quilt. I picked up the fabric for this shirt from the Fabricana (Coquitlam, BC – review to come) customer appreciation sale for 25% off. I had a vision of the buttons and I had to have them. I picked them up at Button Button (Vancouver, BC – review to come). I made this shirt a size 2. 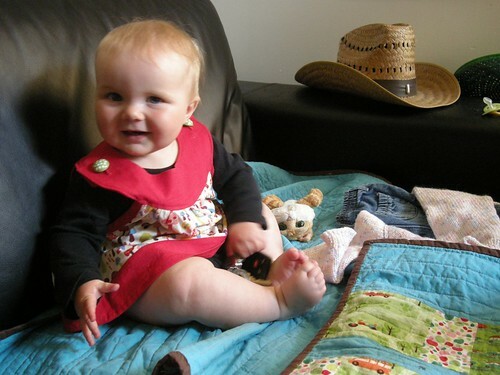 My 7 month old niece is coming to visit today, and I will see how the sizing works for a baby dress. My niece is a giant baby but I think the arm holes might be a little large. Buttons frustrate me! It is so hard to find the right colour, size and style. But when you find the perfect button, it makes the hassle worth it. 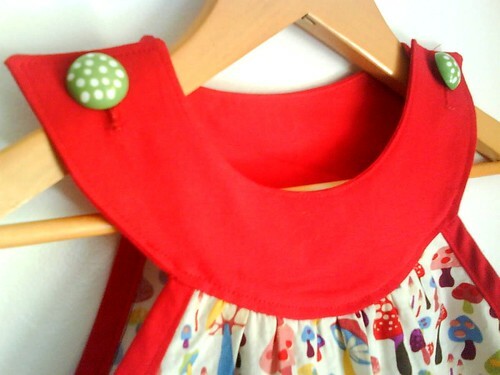 I can now sew on buttons like a semi-pro. Maybe I should try zippers next? Once again I used french seams because they rock my world! I just wish I had a better machine to zip over multiple layers. I have feed issues when I hem over the french seams; I end up feeding it along by hand in those areas, but it doesn’t always work out.